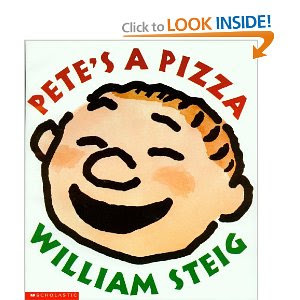 Pete's a Pizza by William Steig is an adorable children's book I enjoyed reading when I was younger. A Pete's a Pizza Pizza Party is a fun twist on a classic birthday celebration. 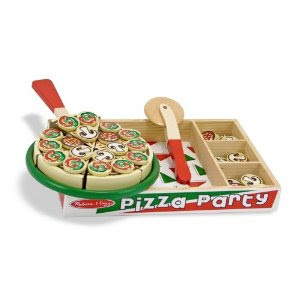 Where there's pizza there's a party- and Pete's a Pizza makes it even more fun! Turn your home into a traditional pizzeria using red and white checkered table cloths (Oriental Trading Co.- ON SALE FOR $1.99!!! ); red, green, and white balloons, streamers, and cutlery; candles, a chalkboard (Mini Chalkboard- Amazon.com- $2.42!!! or 17x23" for $9.79 ) complete with a happy birthday message and a ‘menu’, neon signs, etc. Pizza Relay- Supplies: Collect 'pizza making materials' such as checkers (as mentioned in the book), blankets, strips of paper for cheese, etc. Divide the children into two teams. Instruct them how to make a pizza out of one of their team mates. For example: First, knead the "dough" (team mate), then spread the "sauce" (blanket). Afterwards, add "cheese" (shredded paper), and "pepperoni" (checkers or other round object). Whichever team finishes their pizza first wins. Supplies: pizza dough, red sauce, cheese. (OPTIONAL) pepperoni, olives, mushrooms, sausage, peppers, etc. 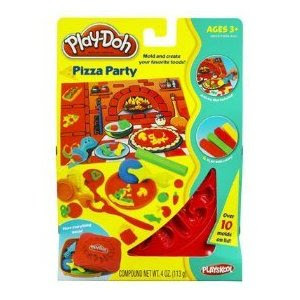 Instructions: Guide your little chefs in making their own custom pizzas from rolling out the dough to adding all the toppings. Then, let the kids enjoy their creations! I found this recipe online- it sounds very rich! Preheat oven to 350°. Add a little oil on the round stone and use brush to spread evenly. In a large mixing bowl, combine brownie mix, flour, water, oil, and egg. Beat by hand for about 1 minute, or 50 strokes. Stir in peanuts or chocolate chips. Spread batter in the pan and sprinkle with M&M's or Reese's Pieces. Bake for about 18 to 25 minutes, or until a toothpick inserted into the center comes out clean. Remove and immediately sprinkle with marshmallows. Cool for 15 to 20 minutes then drizzle with caramel sauce. Slice into wedges when cool. Makes 16 to 20 wedges.